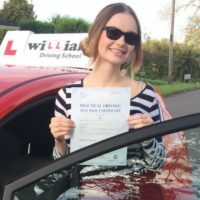 “The main reason for choosing Williams Driving School was because the school was well reviewed. It was also crucial that I would get along with the driving instructor. Learning to drive was pretty much as I expected it to be. My driving instructor Steve Croucher had effective and useful teaching methods which really helped.